If you are planning to go for service tax registration of your company and you are not available yourself to complete the formalities then you can always authorize someone else to do it on your behalf. All that you need to do is to write letter of authority for service tax appeal or authority letter for sales tax registration to the department. Letter to service tax department has to be very short and to the point. If you are not sure of writing such a letter then here is a sample cover letter for service tax registration. Use this sample authority letter to service tax department to write a quick letter. 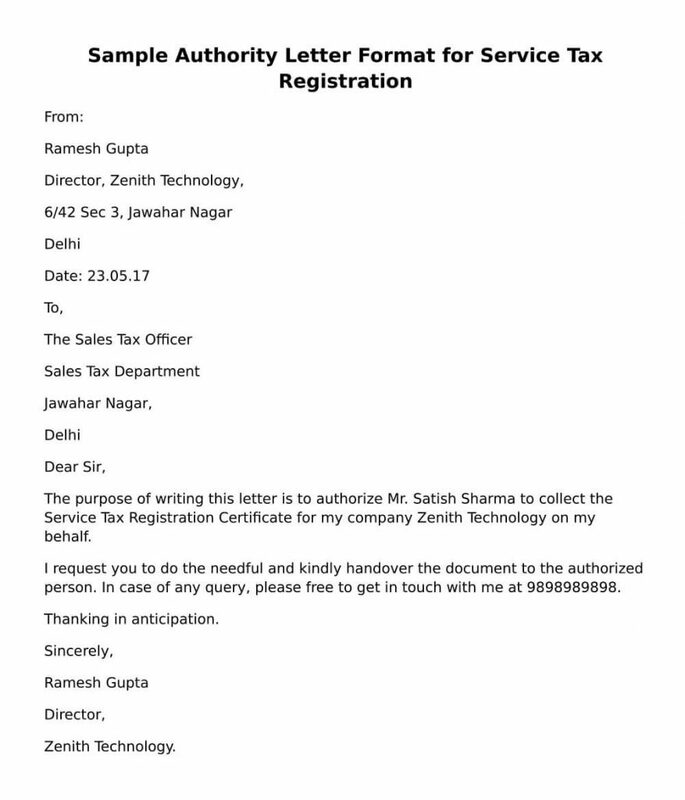 The purpose of writing this letter is to authorize Mr. Satish Sharma to collect the Service Tax Registration Certificate for my company Zenith Technology on my behalf. I request you to do the needful and kindly handover the document to the authorized person. In case of any query, please free to get in touch with me at 9898989898.